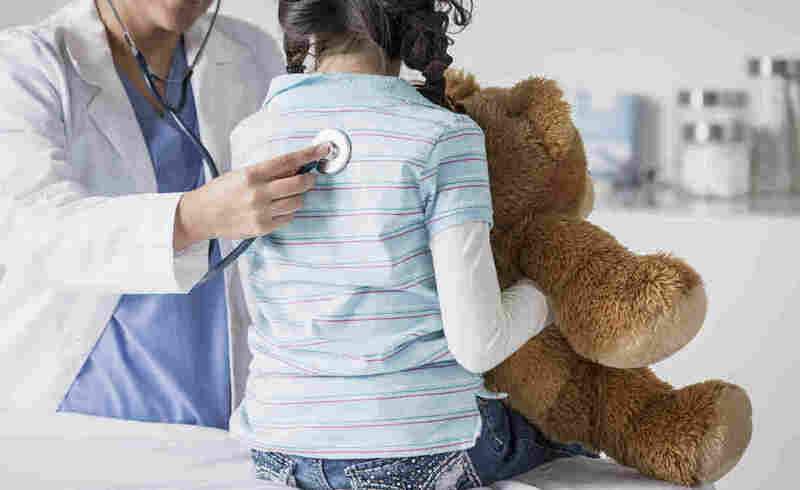 Congress Is Falling Behind On Funding Children's Health : Shots - Health News The delay in coming up with a bill to replace the Affordable Care Act is making it hard for Congress to reauthorize funding for health care for 9 million children through the popular CHIP program. The federal CHIP program funds health care for almost 9 million children. One of the immediate casualties is the renewal of the Children's Health Insurance Program. CHIP covers just under 9 million children in low- and moderate-income families, at a cost of about $15 billion a year. Funding for CHIP does not technically end until Sept. 30, but it is already too late for states to plan their budgets effectively. They needed to know about future funding while their legislatures were still in session, but, according to the National Conference of State Legislatures, the local lawmakers have already adjourned for the year in more than half of the states. "If [Congress] had wanted to do what states needed with respect to CHIP, it would be done already," says Joan Alker of the Georgetown Center for Children and Families. "Certainty and predictability [are] important," agrees Matt Salo, executive director of the National Association of Medicaid Directors. "If we don't know that the money is going to be there, we have to start planning to dismantle things early, and that has a real human toll." In a March letter urging prompt action, the Medicaid directors noted that while the end of September might seem far off, "as the program nears the end of its congressional funding, states will be required to notify current CHIP beneficiaries of the termination of their coverage. This process may be required to begin as early as July in some states." CHIP has long been a bipartisan program. One of its original sponsors is Sen. Orrin Hatch, R-Utah, who chairs the Finance Committee that oversees it. It was created in 1997, and last reauthorized in 2015, for two years. But a Finance hearing that was intended to launch the effort to renew the program was abruptly canceled this month, amid suggestions that Republicans might want to hold the program's renewal hostage to force Democrats and moderate Republicans to make concessions on the bill to replace the Affordable Care Act. "It's a very difficult time with respect to children's coverage," says Alker. Not only is the future of CHIP in doubt, but also the House-passed health bill would make major cuts to the Medicaid program, and many states have chosen to roll CHIP into the Medicaid program." "We've just achieved a historic level in coverage of kids," she says, referring to a new report finding that more than 93 percent of eligible U.S. children now have health insurance under CHIP. "Now all three legs of that coverage stool — CHIP, Medicaid and ACA — are up for grabs." But it's not just CHIP at risk due to the congested congressional calendar. Congress also can't do the tax bill Republicans badly want until lawmakers wrap up the health bill. That is because Republicans want to use the same budget procedure, called reconciliation, for both bills. That procedure forbids a filibuster in the Senate and allows passage with a simple majority. There's a catch, though. The health bill's reconciliation instructions were part of the fiscal 2017 budget resolution, which Congress passed in January. Lawmakers would need to adopt a fiscal 2018 budget resolution in order to use the same fast-track procedures for their tax changes. And they cannot do both at the same time. "Once Congress adopts a new budget resolution for fiscal year 2018," says Ed Lorenzen, a budget-process expert at the Committee for a Responsible Federal Budget, that new resolution "supplants the fiscal year 2017 resolution and the reconciliation instructions in the fiscal year 2017 budget are moot." That would mean that if Congress wanted to continue with the health bill, it would need 60 votes in the Senate, not a simple majority. There is, however, a loophole of sorts. Congress "can start the next budget resolution before they finish health care," said Lorenzen. "They just can't finish the new budget resolution until they finish health care." So the House and Senate could each pass its own separate budget blueprint, and even meet to come to a consensus on its final product. But they cannot take the last step of the process — with each approving a conference report or identical resolutions — until the health bill is done or given up for dead. They could also start work on a tax plan, although, again, they could not take the bill to the floor of the Senate until they finish health care and the new budget resolution. At least that's what most budget experts and lawmakers assume. "There's no precedent to go on," said Lorenzen, because no budget reconciliation bill has taken Congress this far into a fiscal year. "So nobody really knows." Kaiser Health News is an editorially independent part of the Kaiser Family Foundation.